We have two dogs, an 11-year-old Boston (Kitty) and a soon-to-be-2-year-old Boxer (Daisy). Both females, which from what I've read isn't the best of ideas since females with bulldog blood sometimes strike sparks. But the Boston has always been top dog, first on the leash, first through the door, first to eat and to eat undisturbed until she is finished. Top dog enough, in fact, to take on a Great Dane that seemed to be in the position of threatening the family. We often joke she's a miniature Bull Mastiff. I've never been around a Boxer until we bought Daisy. The only indication of dominant behavior from her has been when something threatens two-year-old Kerrigan, the toddler who lives with us. Two days ago, however, at supper my wife reached down to give a couple of pieces of turkey leftover from Kerrigan's dinner to the dogs. Daisy immediately attacked Kitty, and the fight (no blood drawn but rather a fight for dominant posture and submission) continued until we brought it to a stop. "I bet it started because Daisy didn't want Kitty charging at Kerrigan's food," I told Belinda. Today it happened again, and happened without Kerrigan in sight. Potty break over, I tossed them each a Milk Bone -- the game is to catch it in mid-flight -- but Kitty missed hers and it bounced toward Daisy. When she scooted for it, the dominant fight began. And again it continued until I broke it up, which was accomplished by knocking them apart with my wheelchair. I sense there will soon be a new pack leader, or more accurately a new animal pack leader, since we take pains never to let either dog try a dominance trick on us. 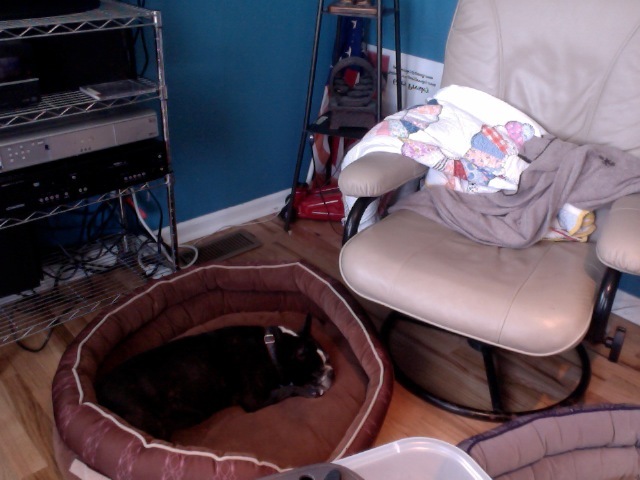 Bostons are relatively small dogs, and thus should live to 15 years or so. But Kitty was hit by a car at 6-months, has a floating hip, and has two bouts of isolated cancer. She also has cataracts, which keeps her close by my side. It's a melancholy thing to see, this instinctual wolf-gene activating itself in Daisy. But I suppose it is less cruel than nature, where the once-dominant animal is sometimes killed or ejected to starve. We had this scenario. Unfortunately, the sick dog was 44lbs and the wanna-be alpha is 10. The little one kept trying to kill the ailing dog as the weakest pack member. We had to keep them separate after I pulled Riley out of Tinker's mouth one day (screaming). Tinker died of cancer at 14 in Feb. and now Riley rules. What was even stranger was that before our chow died, SHE ruled everyone and kept order. She hardly ever had to growl--her regal presence just kept order. All the dogs stayed in line. It is amazing how nature works. My (late) Aleks was an alpha male, and fiercely protective of me. He never, ever, bit anyone (dog or man) but you'd think he was going to rip out one's throat. Cailean is rather the opposite. He does yap rather a lot ... but not every day. Not even most days. He will just have an hour or two out walking where every dog, new or already met, must be barked at. Also people who approach him. No biting or teeth. Other days, most days, he is waggy-tail and happy as a clam. Cailean has a little girlfriend, Sasha, a Yorkshire terrier. They get on famously, eat from the same bowl iof visiting, and will nap on the sofa next to each other. Sasha belongs to a friend of mine, and we can leave the dogs together in my flat or his if we are going out. Here's the odd thing, Cailean is Sasha's only accepted friend. Tiny Sasha attempts to attack everything from a great dane to a chihuahua. Needless to say, they are both on leads when we are walking in town, or out in the countryside.